Each year, the New Haven Promise Legacy Award is awarded to a recently graduated Scholar who has shown a genuine commitment to their education, to fellow Scholars and to the city of New Haven. New Haven Promise is proud to announce Fontaine Chambers as the recipient of this year’s Legacy Award. She will be awarded at the 2016 Scholar Celebration to be held at the Lyman Center for Performing Arts on the campus of Southern Connecticut State University on August 11. Chambers — a graduate of Wilbur Cross High School and the University of Connecticut — credits New Haven Promise’s support for first-generation students of low socio-economic backgrounds as instrumental in her decision to attend UConn. With her political science degree — and a minor in Criminal Justice — Chambers plans to apply to law school and pursue a career in the criminal justice system or in corporate law. Currently interning with a criminal defense attorney and working full time, she has been accepted into a Master’s Program at UConn and she hopes to one day become a lawyer and own her own firm. While at UConn, Chambers became Vice President of Community Relations for a student group at her college that worked with at-risk youth. Along with volunteering at the Boys & Girls Club, Chambers proved to be an influential and inspiring tutor, mentor, and role model for students at her college and in New Haven. Chambers’ citizenship is evident in the various active leadership roles that she has undertaken in her communities. Chambers — who wants to continue traveling and meeting new people — twice had the opportunity to study abroad in London while in college, experiences she describes as profound. 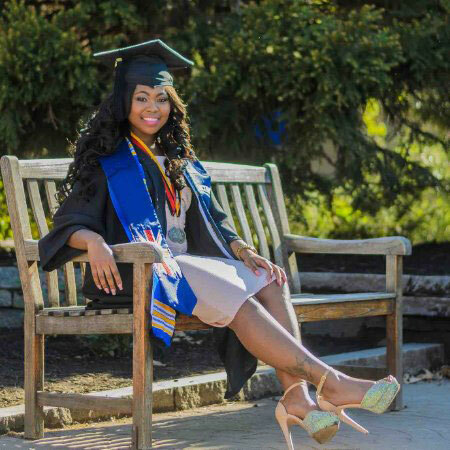 Committed to her community and dreams of leaving an “everlasting impact,” Chambers dreams of “truly making a difference,” of being an inspiring role model for young ladies, and of motivating her family and students from New Haven to reach success. This entry was posted in In the News and tagged Fontaine Chambers, Legacy Award, Study Abroad, University of Connecticut, Wilbur Cross High School by New Haven Promise. Bookmark the permalink. Awesome! !So proud of you.From the time you were able to hold a pencil in your hand.you never stop writing.when she was in Elementary School when it was time for Winter and spring breaks.Fontaine would be in her room getting all her homework assignments done.she is such a perfectionist at all what she do.I can go on and on!! !But I will stop her.Keep reaching for the stars with success.love mommy. I am so proud and impressed. Keep up the great work!!! It’s not very hard to predict that you are going to continue being awesome. It is so refreshing to read about a young student with such talent, ambition and concern for education, fellow scholars and their community. I believe this bodes well for the future of this great country and the entire world. In my golden years, I can rest easy with you in charge. Thank you for being a great inspiration to me. Fountains, I am so proud of you what an inspiration you are for the the young men and women who are coming behind you. May God continue to direct your path and order your steps and that you also continue to have favor in His sight. This is like great music the kind we love playing in our ears. A perfect example of one of the success stories we have in New Haven if you want something bad enough let nothing or no one stand in your way she get this is a great inspiration to us all.